Email marketing campaigns work on so many dynamics and aspects that if one of the element fails, the entire campaign goes wrong. If you are an email marketer, you know how much the emphasis is on everything about the campaign, yet the click conversion entirely depends on the email subject line. The email subject line will decide the conversion rate of your email marketing campaign, irrespective of what the customizations you have done in the email. If the recipient never reciprocates the email you have sent irrespective how great deal, offer or the content you have, the campaign is the failure. What can be the hack here? You must be wondering why is it so important? 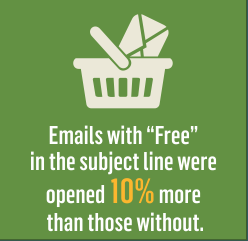 Well, the email subject line is the savior for your email marketing campaign. If that can be done right, your email marketing templates and other stuff surrounding it will be successful. Take the look at the numbers and understand why we are telling so. 35% subscribers believe that the subject line in the emails urge them to click and open the emails otherwise they look at them as the spam. Approximately more than 86% business people prefer email as their specified communication medium. Therefore it becomes essential to create the best email subject line as the part of the email marketing campaign. Once you have become the pro at creating the best email subject line, the chances of receiving the increased number of clicks, conversions, and opens will willingly rise. According to the observation across the prominent email marketing campaigns, we have listed the best strategy to create the email subject line. Now, before the trailer for the film, directors, and producers have started the trend to release the teaser first, the trailer and finally, the film. This is what exactly you have to do as the email marketer. You have the business in your hands, and the offers deals as well as some other benefits as well to give it to the customers. For you, as the email marketer, the email template is the trailer for your complete brand and the email subject line is the teaser. More the responsive email subject line is, the click conversion on the email will increase. Let your recipient do some investigation about what your sent email is all about with the help of creative email subject line. Human tendency is to be curious about something that they know less about. The email subject line is enough to make the recipient curious enough to open the email and then navigating it to your website. All you need to do is, innovate some ideas, learn the strategy to drive the curiosity among your recipients and make your email marketing campaign growing strong and successful. As the holiday season is coming near, the business owners are working on the year-end offers, sales, and other marketing strategies. Its the human psychology, as the end to the certain aspect comes near, the performance gets better. The same tendency works with the email marketing strategies. When the email subject lines shout “Limited stock or Limited edition” it has 22% higher chances to get clicked and open. Its the satisfactory stats for the email marketers. So how do you do this? How can you be the one who can exceed this number? Make the recipient work on your brand’s product or the service deadline. Even you can set the deadline for few hours of the day. 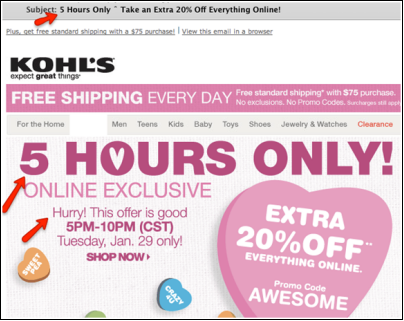 From the above image of the email template, there is a countdown and also the call to action tab is placed well for the customer to act upon quickly. What would you call this phenomenon is Fear Of Missing Out (FOMO). It is the prevalent typography on the social media platform. It is like either you act now and make the most of the offer or simply miss the chance. About 56% of the population are nervous about missing out something relevant information. Which means every now and then, this 56% population are always staying updated about the latest trends, news and checking up on the social sites. Dancing upon this chance, you can earn the most from them. Create the email subject line with the synonym words of the urgency like IMPORTANT. If the email subject line has the word such as TODAY or TOMORROW, the email would hit the OPEN button and therefore the conversion rates will be high. Limited edition or the urgency to act upon, give the customer the best run to go and make the most of the deal. Customers love free offers or the goodies on their favorite product. Imagine if Apple launched the offer to give away the air pods for free along with the iPhone. Maybe the people who are using the Android Smartphone would also buy the iPhone for the sake of the free air pods. Customers love to hear some great offers which are especially personalized for them. Promoting the products and the services will give you the happy customer. All you need to do is include the word FREE in the email subject line. For e.g. free 6 months customer service on the subscription of web hosting and domain for a year. The ROI on your email marketing also becomes high when you mention the word FREE or giving away the stuff through emails. Psychologically while talking to someone if you mention their name in between, the person feels important. Same way when you send the email to your customer starting the email subject line with their name, first name, it will impact your conversion rate, positively. There are many other ways to personalize the email subject line if you do not want to use the first name of the customer. You can use recipient’s birthday/ anniversary dates, location, the previous record of their purchases, relationship status or even their browsing history. Segment your email target audience and accordingly create the personalized email templates and subject line. Are you opening new fashion store in the city? Great. Invite your customers and avail them the special offer so that they visit on the launch day. Majorly the customers subscribe to your brand’s newsletter or the emails to stay updated about your business and brand as well. When you send the email apart from the offer or the discounts, you can share the trending news about your brand such as popular face becoming your brand’s ambassador. Customer loves the breaking news and they would like to stay updated with their favorite ones. It does not make sense if you are going the share the news about your brand’s IPO in NSE because the customer is least interested in such news. You can create the email subject line which sounds like the breaking news about your brand. Make it a BIG DEAL for them. There are no group of people who do not like to hear the stories from anyone, especially about their popular brand. Some of the customers will do the R&D about their brand yet they would like to know its-bits through the brand directly. As the brand owner, you can definitely share the story/ facts about your product or the service with the customers which they might not know about it. The story will connect the customer and your business directly. The emotional touch to your brand or the product is directly correspondent to the sales. The question is: what email subject line to create the story to tell? Simple. You can create the email subject line which will evoke curiosity among your readers/ recipients. Make the first paragraph/ few lines of the content interesting enough for the reader. Then place the CTA tab navigating it to your website for the continuation of the rest of the story. Creating the effective email subject line is what you need for your email marketing campaign to be successful.